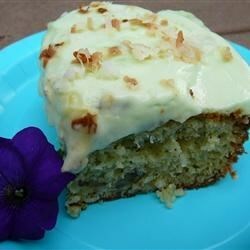 "This cool moist cake is a delightful dessert, especially among the Yuma Garden Club ladies. Besides being yummy, it's also green!" Preheat oven to 325 F (165 degrees C) and grease the 9 x 13 inch glass baking dish or pan. In a large bowl, combine the cake mix and pudding mix. Add oil, eggs and lime flavored soda. Blend well, then stir in nuts. Pour into greased pan. Bake at 325 degrees F (165 degrees C) for 35 to 45 minutes or until tooth pick inserted into center of cake comes out clean. Allow cake to cool completely then frost with Green Thumb Frosting. Green Thumb Frosting: Beat pudding mix and cold milk for 2 minutes. Stir in whipped topping until blended. Spread over cake and refrigerate until served. Cake taste improved when refrigerated a few hours before serving. Best if refrigerated overnight! This cake was a hit at my dinner party....and all my guest begged for the recipe. It was fast and easy to make....and scrumptious! This cake is good and easy to make. However it is not as attractive as I was led to believe and only 1/2 the oil is needed or it is too wet. I made the cake using applesauce instead of oil. I also used whipping cream instead of cool whip and added the toasted coconut to the frosting. My family liked the cake so I will make again. very good. Just like I remembered it to be. This was a great light and fluffy cake. Not too heavy to serve after a meal. And yummy too!